The coatings industry is concentrated in states such as Ohio and Illinois, for example, where unemployment is currently higher than average; both states show 4.7 percent unemployment rates as of Q1 2018. The recent decline in the civilian unemployment rate to 3.9 percent as of the most recent Bureau of Labor Statistics publication has been headline news and suggests that the market for workers is beginning to tighten significantly. 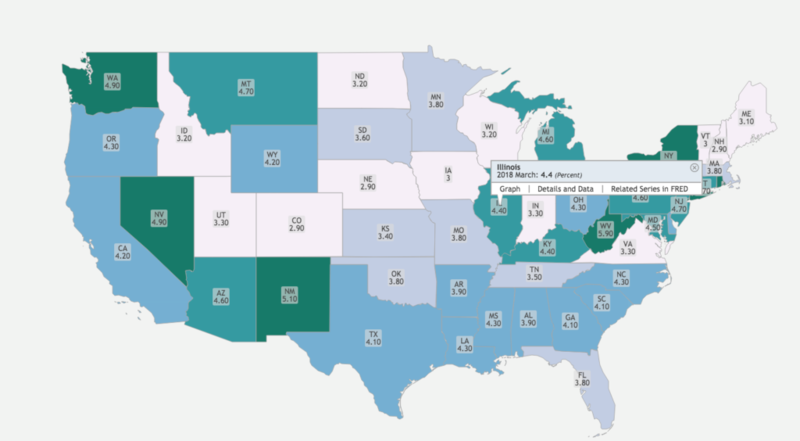 However, there is substantial variance in state employment markets, with states like Hawaii, North Dakota, and New Hampshire enjoying extremely low rates of unemployment, while states such as Alaska, New Mexico, West Virginia, and Nevada continuing to have unemployment rates that are much higher than the national average. As shown below, there is no clear pattern to labor market conditions, which are affected by a variety of issues including migration patterns, local economic conditions, a state of region’s reliance on specific industries (such as energy exploration), etc.